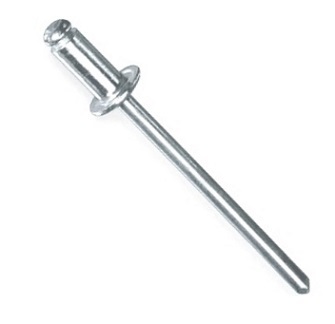 PRODUCT: AB42A 1/8 x 1/16-1/8" GRIP, ALUMINUM BODY WITH ALUMINUM MANDREL, BUTTON-HEAD/ OPEN, BLIND POP RIVETS. MILL FINISH. PRICE/100. ALUMINUM BODY WITH/ ALUMINUM MANDREL. Aluminum/Aluminum rivets are a low cost alternative to screws, bolts, or spot welding. They conform to IFI specification 114 and are quick and easy to install with hand or power tools. Both aluminum bodies and mandrels have a polished finish and are sealed to prevent discoloration. Hole Size: 0.129" - 0.133"
Grip Range: .063" - 0.125"
Equivalent Parts: GR-AA44, AD44ABS, ABA44, ABA44, AB4-4A A/A44 D, AAP-44, GAMD44"
1/8 x 1/16-1/8 In. GRIP, ALUMINUM BODY WITH ALUMINUM MANDEL, BUTTON HEAD (OPEN/DOME), BLIND POP RIVETS. MILL FINISH. 10,000/BOX. PRICE/BOX.